The current craze for statement jewelry is not a new fashion trend. 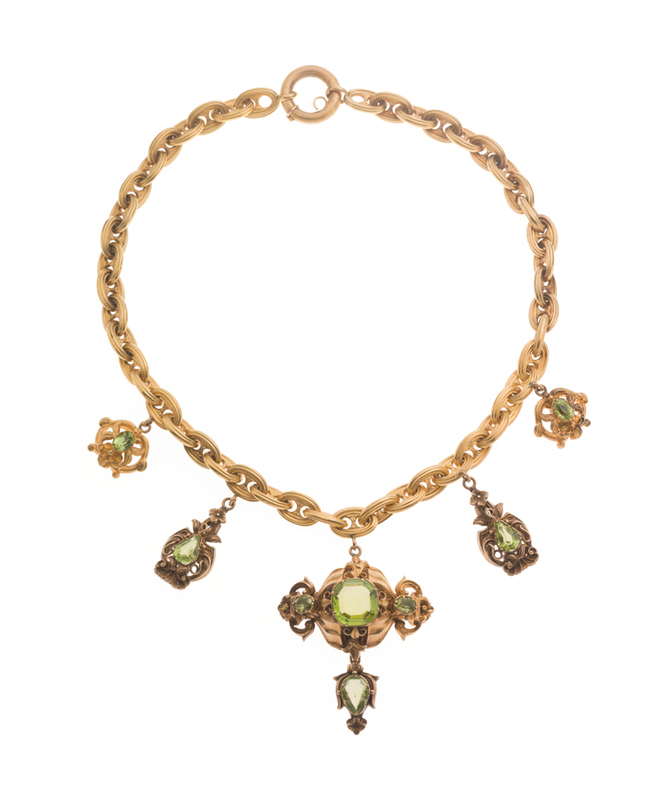 One item in our jewelry collection that is a wonderful example of an early twentieth-century signature necklace uses the August birthstone peridot. Marie Vipont de Riviere Merwin, who left Merwin House in Stockbridge, Massachusetts, to Historic New England, owned this necklace. It is fashioned from an elaborate Victorian watch chain, two pairs of Art Nouveau earrings with peridots, and a large peridot brooch. Peridot is called “the gem of the sun” and legend has it that if it is set in gold, it will dispel enchantments and protect one from nightmares. Discover more stories from Historic New England’s jewelry collection in our newest publication, Keepsakes and Treasures: Stories from Historic New England’s Jewelry Collection, by Associate Curator Laura E. Johnson. The book is available for $19.95 (plus shipping and handling). Buy it online or call 617-995-5924 to order. Jewelry fans will have a chance to see these and other gems in May 2017 when Historic New England opens the exhibition Mementos: Jewelry of Life and Love from Historic New England at the Eustis Estate in Milton, Massachusetts. Mementos features approximately 130 pieces of jewelry with complementary textiles, portraits, and photographs, all carefully chosen from Historic New England’s extensive collections.